Welcome to the 364-acre roller coaster capital of the world! 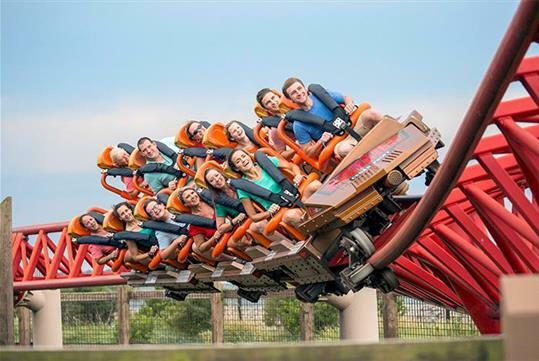 With 18 world-class roller coasters, Cedar Point is home to some of the world’s biggest and most exhilarating coasters, including Top Thrill Dragster, Wicked Twister, and Steel Vengeance. 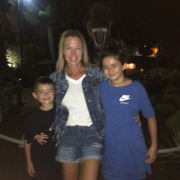 The theme park also offers three kids’ areas, Cedar Point Shores Waterpark, Dinosaurs Alive!, numerous shows, and more. One day at the park isn’t enough! The park houses 364 acres of rides, attractions, shows, and entertainment. It takes most visitors two days to explore all the park has to offer. 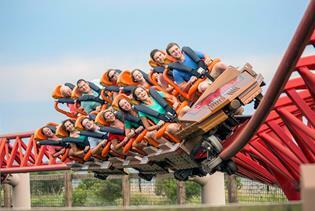 Test your bravery on 18 world-class and award-winning roller coasters. Three kids’ areas are available for families. Separate tickets are required for Cedar Point Shores Waterpark. Parent swap is available for families. Cedar Point is the world’s best destination for thrills. 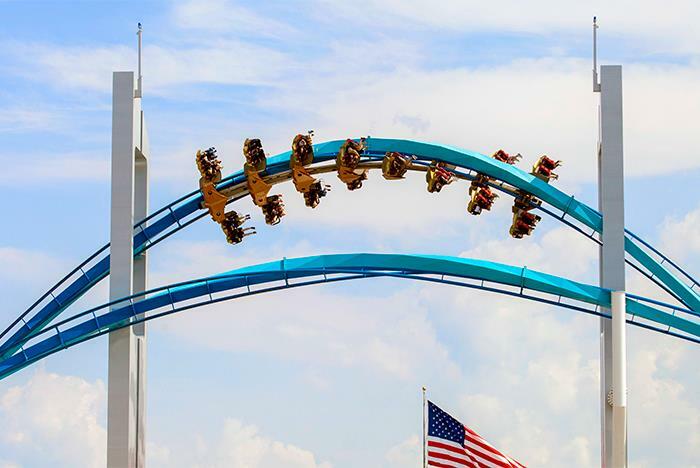 Located in Sandusky, Ohio, Cedar Point is home to 71 amazing rides, including 18 world-class roller coasters, like the signature Millennium Force giga-coaster. With over 150 rides, shows and attractions, it’s easy to see why one day is not enough to explore the 364-acre park. 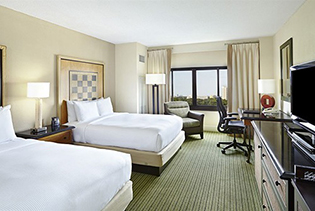 Three kids’ areas, comfortable and convenient overnight accommodations, a mile-long beach and great restaurants also make Cedar Point the perfect family getaway. 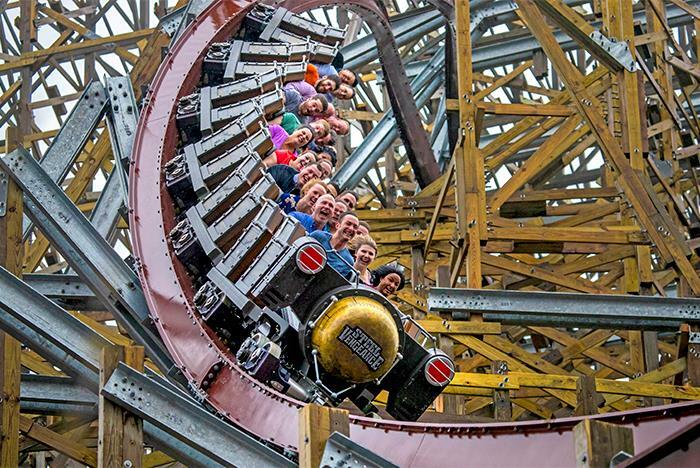 In 2018, Cedar Point introduced the world-record-breaking Steel Vengeance – the first and only 205-foot-tall hyper-hybrid roller coaster on Earth. Coming Summer 2019 - Forbidden Frontier on Adventure Island. This website was really simple to use and it was cheaper than any other site. Had no problems using the tickets at the gate. It was amazing and we can’t wait to go back. We will use Reserve Direct again! "Up Up & Away we Go"
Tons of fun roller coasters and water slides and days of fun!! Young kids, teens, 20’s and adults all had a blast!! 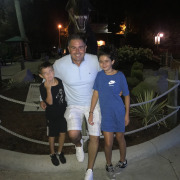 "What A Fascinating With the Worlds Record of Most Coaster Rides"
What a place to enjoy a lot more than just coaster rides. If you don't want to wait more than 30 minutes to ride some of the most fascinating recent coasters, there are other things to do around Cedar Point not mentioned in media ads. Perhaps play video games, enjoy fine exhabitiion center food such as old fashioned sonw cones, corn dogs, belgium waffles, soft serve ice cream and perhaps old fashioned trail blazer food at the Frontier Town take out restaurant. 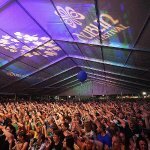 Enjoy live shows anywhere from Ice skating exhibition by Christmas character Snoopy and Peanuts, Country and Western entertainment and simple Piano entertainment plus comedy live stage entertainment. Also enjoy fine handmade Arts and Crafts by Kentucky and West Virginia craftsman, a minature petty farm with an opportunity to pet and feed animals and of course wonderful floral landscape, among the finest in the industry. Also a wide array of gifts and souvenirs for all occasions especially around Christmas holiday immediately upcoming even if is five to six months away from the Christmas shopping season. Never too early to be doing this after June 1 of any year. We’ve been coming for several years to Halloweekends. The kids(teens) always have a great time. It was pretty busy the whole weekend that we were there. They could have used more staff so the food & drink lines weren’t so long. Otherwise, a great visit! 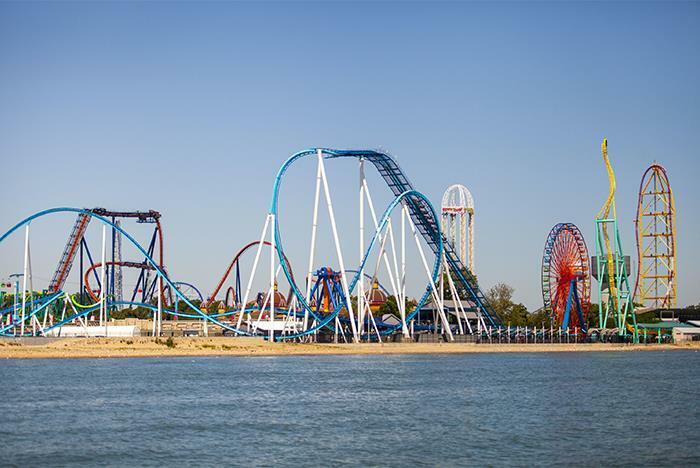 There isn't a comparison to any other park except maybe Disney as the variety and fun that can be had at Cedar Point. Six Flags in Arlington, TX has nothing on Cedar Point and Kings Island is just a dirty wannabe park compared to Cedar Point. "What a Most Interesting Theme Park To Visit Worldwide"
From my Interesting experience as a favorite college student summer job place, I have met many interesting guests and shared not only school and youth pleasant pastimes, also got familiar with their consumer habits as a Marketing/Management major at Ohio university, Athens OH. During my senior year at Ohio University, I have conducted a Marketing Research project regarding the park operations. 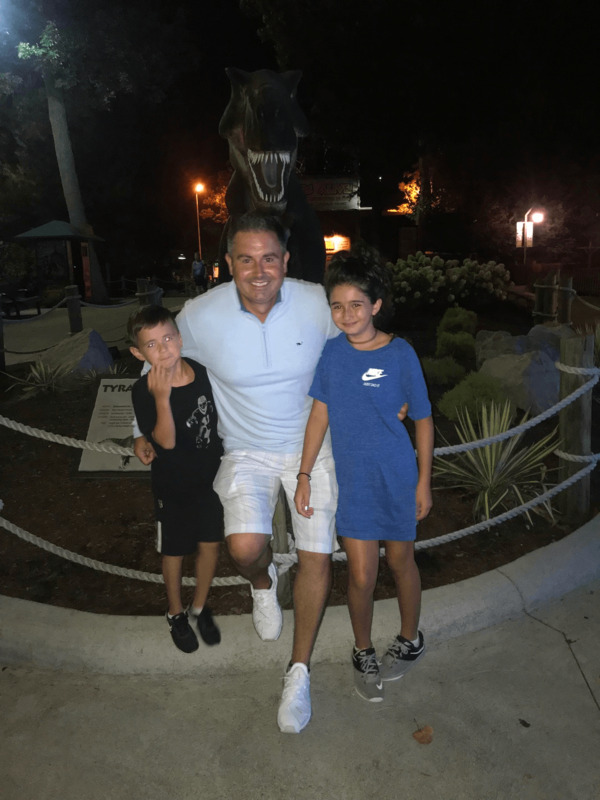 From being a past shareholder and guest, I have spent several thousands of dollars enjoying not only the rides and live entertainment. Also I have purchased many souvenirs and given as gifts to family and friends primarily for Christmas which is my favorite holiday due to many festive decorations similar to Cedar Points floral arrangements similar to many Conversatories and tourist gardens such as Biltomore House and Gardensin Asheville NC. Please keep in mind that this attraction offers man area historical facts in the Sandusky OH area, handmade Arts and Crafts plus a mini petting farm. This is an ideal place for group picnics and Bar Parties similar to Christmas and New Year. Many tourists and Lake Erie toutist attractionson nearby Kelly's Island and Put in Bay Island near Marblehood Peninsula State Park within less than one hours travel time from this attraction. Suggest a two day visit and an overnight stay anywhere in Erie County OH does not have to be on Cedar Point grounds. Also overnight light trailer and primitative camping available off Cedar Point grounds. Yes. Please get your hand stamped as you exit. Cedar Point does not offer rain checks. Depending on the type of precipitation and/or wind, certain rides close. Can I smoke at Cedar Point? Smoking is permitted in designated areas inside the park only. You must fill out a missing item report online in order for your item to be returned if found. Once the report is submitted, you will be sent updates on your item. 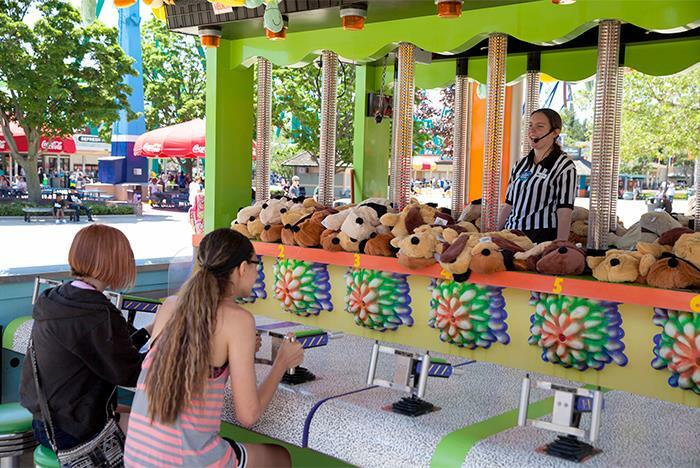 Please note that if you’ve lost an item on one of our rides, our ride hosts may not be able to retrieve it immediately, so please fill out the missing item report online. Unclaimed items may be disposed of after 48 hours. As a reminder, Cedar Point is not responsible for lost, stolen, or damaged articles. Can I take my bag or other belongings on a ride with me? Loose article policies vary for our rides. Note that Valravn, Top Thrill Dragster, GateKeeper, Rougarou, Magnum XL-200 and Millennium Force riders are required to store their belongings (purses, prizes, video cameras, etc.) in the secure lockers at various ride's entrance's as they are not permitted in line or on the rides. It is recommended that guests rent a locker for the day to avoid losing loose articles while on rides. Do the rides have weight limits? Can I pack my own lunch and bring it into the park? Guests are not permitted to bring any food or drink items into the park. However, individual, unopened water bottles, as well as special diet/need items, may be brought into the park. We do have public picnic shelters located outside the Main Entrance. Guests with coolers, baskets and other carry-in items can place them on a picnic table in these areas. Cedar Point is not responsible for items left unattended in the picnic shelters. Shelters are available on a first-come, first-served basis. Cedar Point Shores Water Park does not have a public picnic shelter. All-Day Lockers have in/out privileges all day with no restrictions. All-Day Lockers are located just inside the main gate (near Ocean Motion) and at Cedar Point Shores Waterpark. All lockers accept cash and credit cards only. Coin and debit cards are not accepted. There are NO overnight rentals. 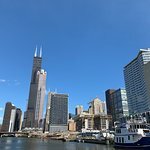 Do you have Strollers and Wheelchairs available for rent? Does Cedar Point have a dress code? Yes, Cedar Point has a dress code designed to maintain the park's family atmosphere. We do not allow clothing generally considered offensive. Profanity, obscene gestures, obscene statements, pictures of illegal substances, motorcycle colors, insignias of para-military groups, all gang-related items or clothing, costumes or disguises that conceal identity and adult full-face makeup are prohibited. Shirts and shoes must be worn at all times, including entering or leaving. Swimwear must be sufficiently covered. Where can my pet stay while I'm in the park? For just $15 per animal, per day, your pet will be provided with a cage or run, dry dog food and fresh water. Owners may return to feed their pet throughout the day. Please note that our staff does not walk, handle or provide special care or feeding times for pets. Pet check is open one hour prior to park opening till one-hour past park closing. Open 5:00 pm to 12:30 am on HalloWeekends Fridays. What security procedures are implemented at Cedar Point? Cedar Point uses a variety of methods in securing our parks including uniformed and plainclothes officers, and video surveillance monitoring. Cedar Point does not tolerate guests who fight and/or harass other guests while on our property. People who engage in this behavior are subject to being ejected and potentially banned from the park, and may be subject to arrest by local police. 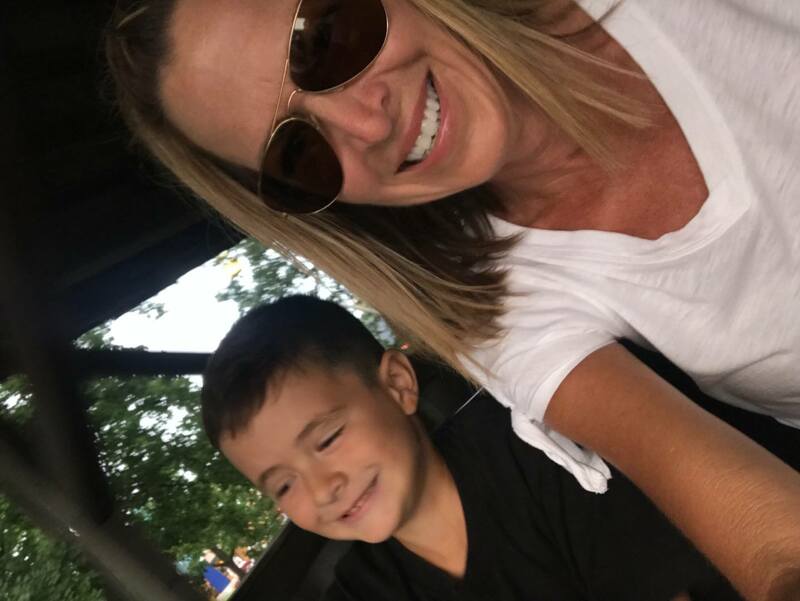 Does Cedar Point offer a Parent Swap program? One parent waits in line to a coaster or other height-restricted ride. 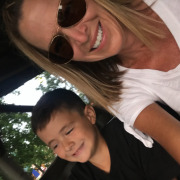 After riding, they give their Parent Swap pass to the ride operator, and the other parent/guardian, who’s been taking care of the little ones, can walk up the exit to get right on the ride. 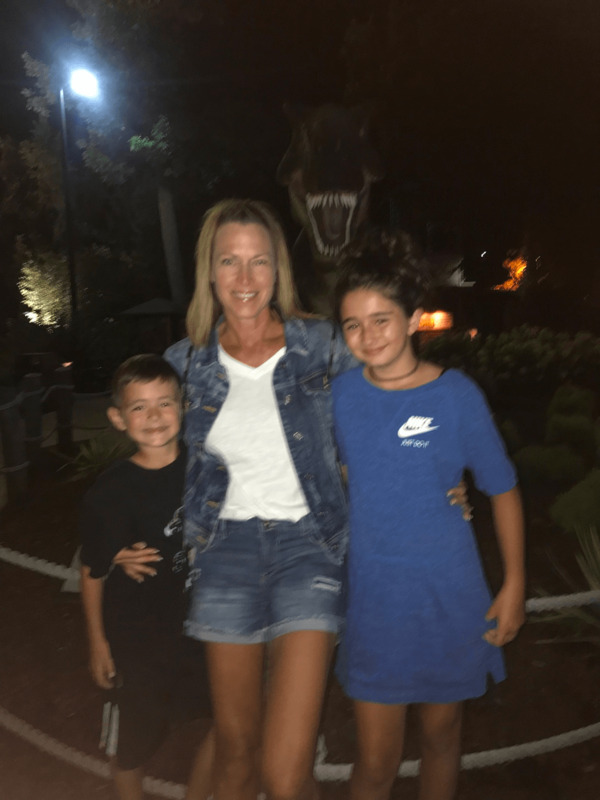 What children’s areas are offered at Cedar Point? 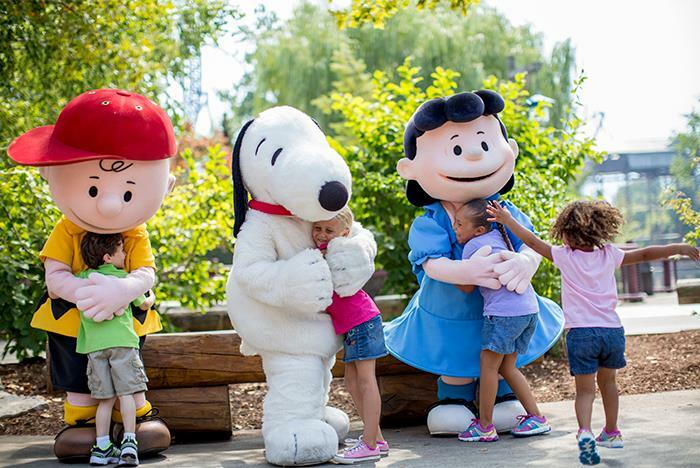 The ultimate space for kids is Planet Snoopy. Our newest children’s area offers seven puppy-sized rides for your little ones. Fly into space with Snoopy, or see if you can beat the Kite Eating Tree. When you see the colorful carousel, you’ll know you’ve arrived at Kiddy Kingdom. Fun rules here, with rides like 4 x 4 Trucks, Helicopters and many more! 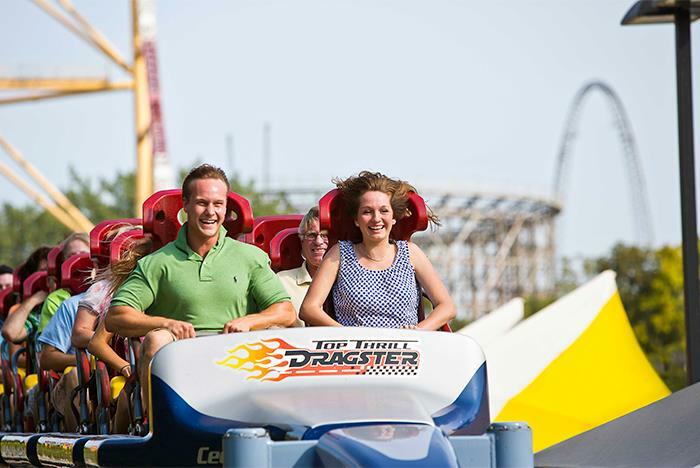 In the shadow of Top Thrill Dragster, you’ll find the place where fun is here to stay. 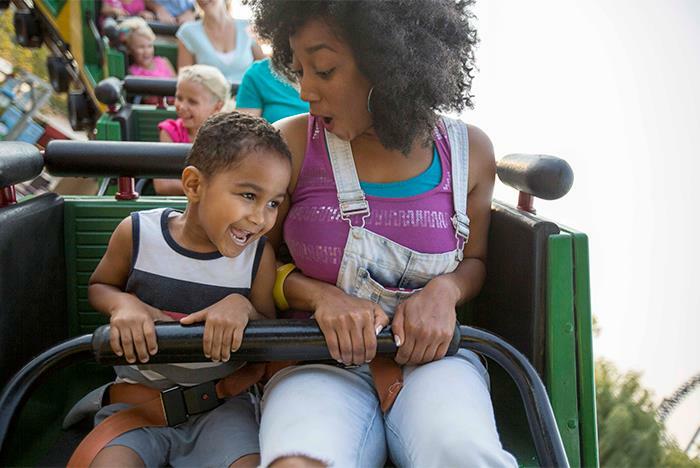 Camp Snoopy boasts seven exciting rides, featuring Woodstock Express, the kid-sized coaster that lets you capture the moment with an on-ride photo. A hop, skip and a jump across the Midway from Camp Snoopy is the Gemini Midway Area. 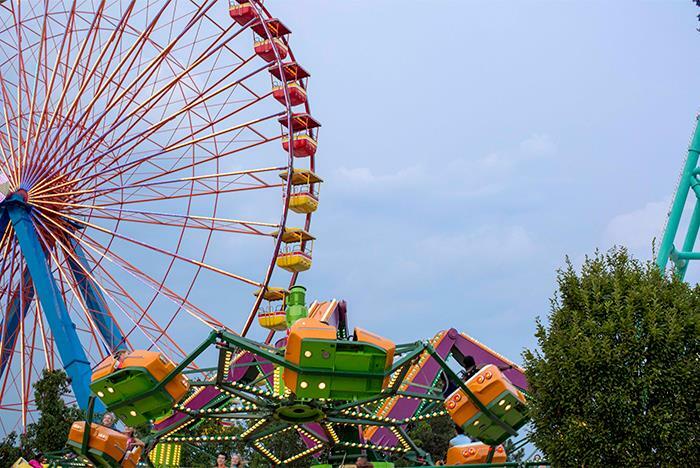 Kids have their choice of three children and family rides that give them a taste of the big kids’ thrills. It is home to our new rides: Pipe Scream and Lake Erie Eagles. Does Cedar Point have baby changing areas? Yes. There are two Family Care Centers in the park. One in Planet Snoopy near the front of the park and one near the entrance to Maverick in FrontierTown. Our Family Care Centers are a convenient and comfortable location for baby changing and nursing, with private infant feeding areas. All Family Care Centers are also First Aid stations. Are children’s meals offered at Cedar Point restaurants and quick service kiosks? Children's meals are available in the Kiddy Kingdom, Camp Snoopy, Planet Snoopy, along with the main midway and in FrontierTown. Meals range from peanut butter and jelly sandwiches to a quarter-chicken. The park's full-service restaurants also offer children's menus. Natural fruit juices and milk also are available throughout the park. Cedar Point offers a guest service to quickly reunite separated children and parents with cell phones. Please sign up for KidTrack at Guest Services (at the Main Gate), the Resort Gate or Town Hall upon arrival.